Welcome to the Geared for Guys Blog Tour!! I was very excited when Emily informed me that she had written a book with guys in mind. There is often lots of "boy" fabrics & "baby" things... not not many GUY patterns! The book is full of information on fabric selection with guys in mind & so much more. When Emily sent me the book to review I instantly fell in love with the Gamer pattern. It has nice clean lines & typography... how could you go wrong?? 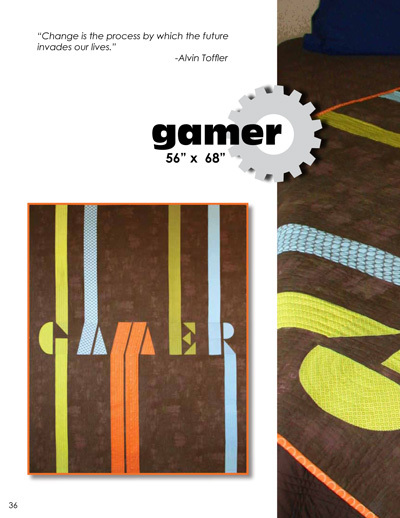 So I made my own Gamer quilt from Robot Factory by Caleb Grey for Robert Kaufman. The wind was a bit crazy this morning so it was impossible to get a flat shot. The fabrics I chose have less contrast than the original, but I'm quite happy with the result. I made this quilt with my special someone in mind, but I have a feeling my brother is going to ask for a matching one!! I need 1 binding fabric & 2 backing fabrics for a pieced quilt back. THE RULES1. Leave ONE comment to enter. Tell me what fabrics you use for the binding & for the backing. You have until 10PM PST time Tuesday, May 8th to enter!Giveaway now closed. Winner announced later today now that all 3 giveaways are over! The next stop is tomorrow at Canton Village Quilt Works! I love the book for guys! I think the two oranges for the backing and one of them for the binding. I love bright! Love this pattern! I think your choices depend on the age of the person you are making it for. For a little boy(age wise cause their all little at heart) I would use the robot print and one of the light blues for the back and the orange for the binding(or scrappy). For a grown man(agewise) I would use the brown and dark blue on the back with the red for the binding ( or scrappy). Great quilt! I would go with the orange robots and the red for the backing and the white robot fabric for the binding! I have three nephews that this book would be great to have on hand for. I am always at a loss as to what to make for them! If it were me, I'd probably choose the red/orange print (in the middle) for the binding and the other orange & brown for the backing! I'd choose the light blue on the left for the binding and the red-ish fabric in the center for the back. Great pattern for a gamer, I guess your "special someone with no name" will love your quilt :o) Thanks for hosting the giveaway, Julie! The two oranges for the backing with one of the blues for the binding. Adorable quilt. I would use the brown that you used for the M as the binding, and then the blue and white print for the back. I just like the visual framing the brown will give for the binding.. as if the lines for the M shoot down and then frame the entire quilt. Very futuristic. 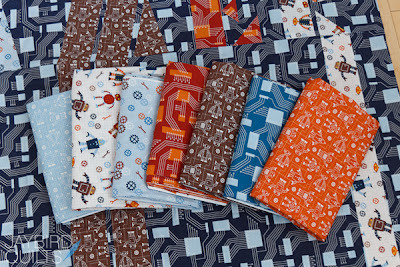 I would use the darker red/orange fabric for the binding (the one in the middle) and I would use the brown and the robots print for the pieced back. This book is teriffic!! What a show of creativity! I would do the red fabric for the backing and the orange for the binding. It would offset the the front of the quilt nicely. I say the orange and red for the backing and one of the light blues for the binding (or the orange and red would look good for a binding too). Cool quilt! I'm going to want more contrast in mine. Kona solids on top with the fuzzy fabric on back. Maybe the Tetris NES color palette? Can the fuzzy back be in super Mario colors? Reference chart emailed. I would choose the third one for the backing and the last orange for the binding to make it pop! I would choose the dark blue to give some contrast for the binding. If you wanted to spend the time doing it, a pieced backing of all of your left-over fabrics would look great. I'd use the blue that has the same pattern as the background for the binding, then a mixture of the others for the backing - big stripes? Eu usaria vermelho e laranja com branco(amo)Obrigada. I NEED this book! Every post I see shows yet another quilt that would be so amazing for my boyfriend! As the mother of a couple of gamers, this looks like the quilt for my boys. My son has an Austin shirt that he like to wear that features black and brown and red but with some bright colors of greens and yellows. I love orange....so I would probably use the orange for the binding....or maybe even a combo of all of the "gamer" fabrics....I would probably go with the light blue "gear" fabric for the back...just to keep it simple. I think the oarange would look great for the backing along with the other red/oarange...maybe the brownish for the backing!!!!! THanks for the chance to win! I would use the orange/red for the binding and make the backing out of the robots and the two darker blues. Thanks for entering me in your draw. So stinkin adorable!!! I would like to see the orange for binding, and probably the robots that are the R for the backing. Great quilt! I would use the two oranges for the back in some pleasing combo and the light blue to the left on your fabric picture for the binding. Love the quilt. Nice giveaway too. Thanks! That's an awesome quilt Julie. It would be perfect for my oldest son. 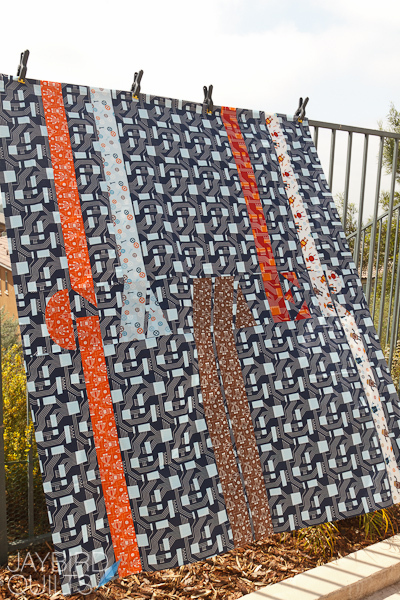 I think the white background with robots and the light blue to the right of it and the orange fabric on the end are the three I would choose for your quilt. The brown and white for the backing, and the far right orange for the binding. Thanks for the giveaway! I would use the brown for the binding and the red and orange for the backing!!! BTW way cute quilt Love it!!! I would bind with the "A" fabric and back with the "M" I am sure he will love it. LOVE that pattern!! OMG! I think I need it to make my son in law a quilt. I would piece the back and mk sure it has black. I would also bind it with an orange color. I love to frame my quilts with a strong contrasting color in the binding. So fun! I think the red one for the binding and the darker blue second from the right and the orange for the backing. Thanks for the giveaway! its gotta be the orange and I do hope I finaly got this set up so you could get to the addy!!! I would use the red for the binding and the orange and brown for the back. Thanks for the chance to win a copy of the book. Use the orange for the binding and the brown for the back. Thanks for the chance! Looks like an awesome book! :) I'd love it for the guys in my life (hubby & son). I'm think the red for the binding, and the Orange for backing. I would choose the red print in the center for the back and the orangish on the right for the binding. Thanks for the chance to be a winner! I love the robot fabric. I would back with the first two in the photo and bind with the brown. I'd use the orange (G) for the binding and the orange and red/orange for the backing. Maybe with some of the brown thrown in. I would go with the G orange for the binding, then the A for the backing. (like the R for the backing too) Awesome quilt! I would do the red/orange print on the back with the orange as a binding. I've got to make these for my boys for Christmas. PERFECT!!! I would use the orange for the backing and the red for the binding! I'd go with the brown and the dark blue for the back, with the light blue on the far left for binding. I would use the light blue with cream robots for the binding. For the back, I would use the brown with cream robots and the cream with mulitcolored robots. White and Red for the back. I would bind with the brown. And back with the blue and orange all over robot prints. 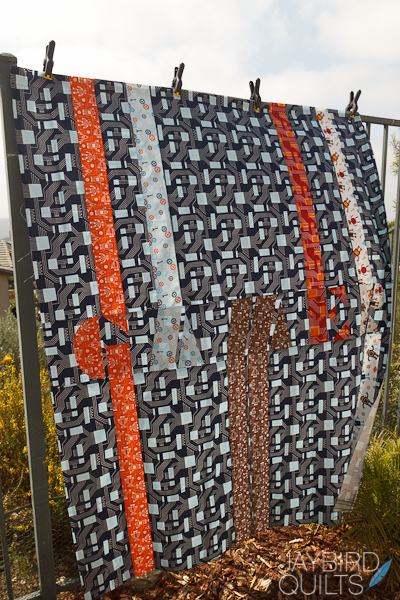 Love the bright orange for the back, and dark orange for the binding - awesome quilt! I would bind in the orange and back with the white robot fabric. I don't think you can go wrong with any of the fabrics, though. Great 'guy' quilt! I'd use the orange on the right for the binding and the light blue/gears and red/orange for the back! Look forward to seeing what you choose. Love this quilt! I agree with some of the other posts. I would use orange for the binding. You can back it with any of the robot fabrics except for the blue- might be too much. Thanks for the chance to win an e-copy of this book! I would use the orange on the left for the backing and either the other orange or the brown for binding. I'd say the brown robots/orangerobots for the back and the orange robots for the binding. Love the book, too, hope I win!! I`d choose light blue for the back and orange and brown for binding. I would use the red and orange for backing and the brown robots for binding. If there is enough of the orange left for binding, it would look great on front and back. I would use those two fabric you have that are not on the front, a light blue and the medium blue (looks like computer board pattern). Then I would bind it with the orange to make it "POP". 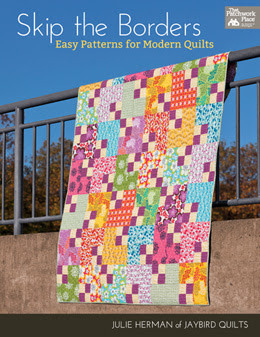 I love this pattern and would love to win this book. My little guy would really like this quilt. And no I will not say it. I like the medium blue for the binding and the dark orange and brown for the backing. Thanks for the giveaway. I originally thought the lighter blue for binding, but I think the brown would look better. For the backing I'd go with the mid blue with the orange for the backing. I would pick the light blue print with the gears and wrenches and the orange on the far right for the back. I would also use the orange for the binding. I love the red for the backing and the orange for the binding. I think that will add just the right amount of punch to your fabulous quilt top! I would bind it in the orange on the far right and use the first two on the left, the light blue and the robots, for the backing. Thanks for the giveaway. I think the orange for backing and binding in brown would be really pretty. This is a neat book. I would use the brown robots for the back and the light blue robots for the binding. Any of them would be good choice, though! I dont think you can go past the dark orange/red for the background and the darker blue for the binding, or maybe the lighter orange, no definitely the blue. Yep. Would love to have the book and make some of those "manly" quilts. I quite like the idea of aft hues with a sudden bright splash. The light blue, robots maybe for the binding....the orange is also great for either. Would be great for the binding and soft blue for the backing.....the book sounds great too, I have lots of 'little boys' in my family. So fun! I think it's great that there is a book geared to guys! Your quilt turned out beautiful!!! I would go with the orange and white fabric for the binding and the light blue with the gears for the backing! Can't wait to see what you choose! I'd use the orange for binding, and the brown and white background fabrics for the backing. I would use the fabric that is in the center for the backing and binding. I would bind in bright orange and use the other orange and the brown fabrics for the backing. You've found another great book to inspire creativity. What a fun quilt! I hope that you use the drk blue background you mentioned for the binding. For the backing I suggest the lt blue fabric that looks like it has multi-colored gears & the brown fabric! What ever you do use I hope that you will post a pic of the finished quilt!!! I like one of the oranges for the back and the darker blue for the binding. Looks like a great book! I like the orange and the red for the back and maybe the light blue that's not on the front for the binding. orange for binding and brown and dk blue for back...nice quilt! Thanks for the chance! I like the brown robots for the binding and the orange robots with either the blue circuits or the blue gears/wrench print for the back. 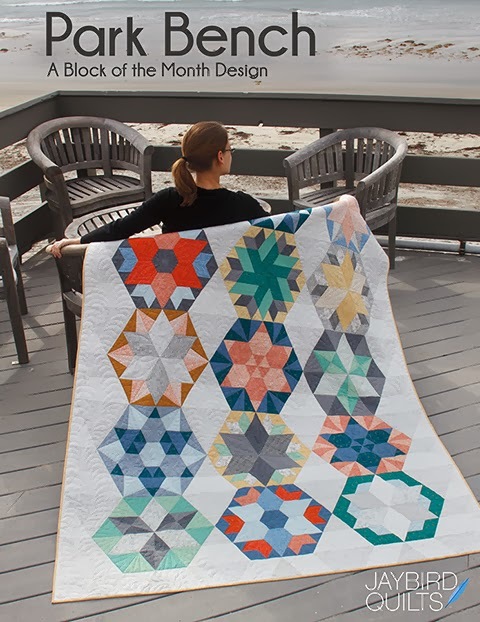 i'd use the middle orange print for the backing and the orange on the right end for binding -- i'm thinking of my gamer granson who asked for another quilt. i could do this quilt for him! I would use the brown for binding and the rust for backing. The orange (at least it looks orange on my monitor) and the white for a pieced back is my choice. I would use the orange on the right for the binding (I just love orange binding) and the robots on white and the brown print for the backing. 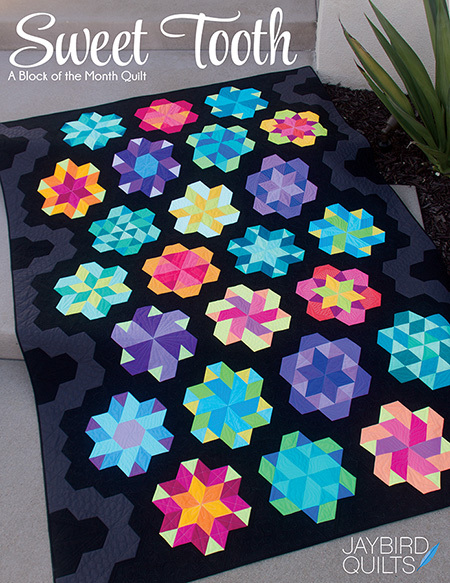 By the way, I showed this quilt to my husband and he got really excited about it and wants me to make him one! I have never seen him get excited about a quilt before! Background blue for binding and the lightest blue on the left for backing. Fantastic quilt! I'd use the brown and the darker blue next to it for the back and the orange for the binding. Thanks for a chance to win. My grandson would like this one. I'm glad it is your choice. I would use the two middle fabrics, the orange and brown and the brown for the back and the light with robots for the binding. If I was doing it, I would have used each fabric for the binding, as I like scrappy bindings. I like busy backs so my quilting doesn't show. I know he will love. I would use the brown for the binding and the backing. I like the simplicity in having the binding and backing in the same fabric. I would use the red circuit print for the binding and the orange robots for the binding...or the other way around. 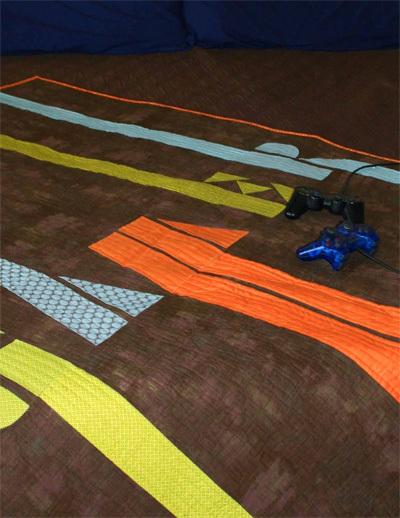 As a gamer myself, I really appreciate this design and your quilt! Thanks for the chance to win this book. Can't wait to get my hands on it. I would use the two toned orange for the binding and the brown print for the backing. I would probably mix up the back another fabric. Maybe a narrow orange stripe or two. I think I would go with a pieced backing with lots of the fabrics...or a neutral solid with a pieced vertical stripe of all the robot fabrics. Then I think I would definitely use one of the oranges for the binding. I'd chose the background fabric for binding, and for the backing I'd either use red or do a patchwork. Thanks for the chance to win this amazing book. I would use the orange for the binding. For the backing, maybe one of the light blues. My preference is the 2 oranges for the backing and the blue gears for the binding. It's busy, so I'd have to choose a solid dark blue (that goes with the blue in the background). Still lovin' Pac Man, Asteroid and Hangman (the one with the Cowboys). I would probably use the red/orange in the middle for the binding, because I like a pop of color on the edge. I would use the two fabrics on the right, the orange and the medium blue just because I like that color combination. Very nice quilt by the way! I think the brown and one of the orange fabrics. A warm coloured back to counter the mostly cool coloured front. I think the orange fabric for the back with the orange/red fabric for the binding. I love the robots on the white background pattern. I would use that and a blue fabric for the backing and an orange print for the binding. great quilt! looks like a fun book. i'd put the brown robots & the orange robots on the back. And use the red print for the binding. Awesome looking quilt! I'd do the binding in the light blue fabric on the left. Thanks for the giveaway! I suggest the dark red with orange and the brown for the backing and the background fabric for the binding. This is an awesome quilt and the book sounds awesome too! 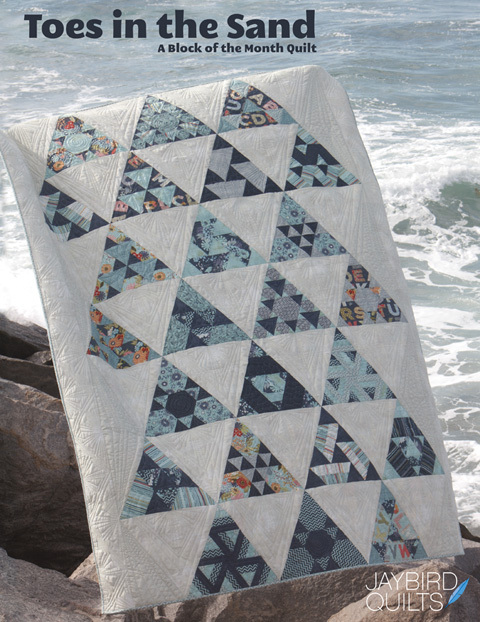 I am reading and planning my first quilt, so I am no expert, but I would use the light blue to the far left as the binding. 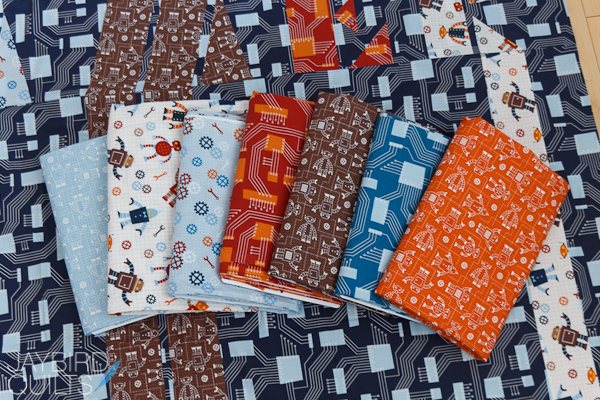 And for the quilt back I would use a combination of the brown w/robots and orange w/robots. Good luck to everyone and thanks for the giveaway! You know what? I would use ALL the fabrics in the binding and the backing... you have them so why not showcase them! Great graphic quilt. Super give -a-way, never many guy quilt books out there! That is a really cute quilt. I would bind it in the orange you used for the G and back it with the fabric used for the M.
What a fun quilt design! For the gamer quilt I would suggest the gears on blue background and the robots on white background. However, I would use a scrappy pieced binding. I just love doing scrappy bindings. I think it just gives the quilt a little extra pop! I so have to make that quilt. Ok I would bind in the orange you used for the "G" and then use the dark blue and the red with orange on the back. I would love to see the binding in the orange robot fabric. I think, with that binding the orange and red print would be a great backing. I love this robot line, I have a quilt top and back in it waiting to be basted, quilted and bound. I would go a solid navy for the back, with some pieced details in the robots. I would do the binding in rust or orange. Wow! I love that quilt...excellent job on the fabric choices as well, very fun. For the binding, it's a toss up between the light blue robots (a little more subtle) and the orange robots (more bold, my personal favorite). For the back, I would definitely use the orange robots and the red/orange circut board print. I love the idea of the book - when will it be available? I am struggling w a quilt for my newphew's graduation from college. Great quilt! I love this book concept. We all have men in our lives that need a little handmade somethin from us. I like the blue or the brown fabric for the binding. The blue because it is bold and it is not a repeat and the brown because it is a nice bold accent. Some of the others seem too soft. I like the robots on white for the back, unless it is going to be well used, because white can get dingy fast, so my other choice is the orange robots with splashes of the dark blue and light blue. I love it! I love bright so I would have to sat the orange for the binding and the red/ orange or the backing! I love it! I would use the orange for the back and the brown for the binding. My son would love this quilt! Last orange for the binding and brown for the background! Definitely the medium blue circuit board print for the binding, and the orange robots for the backing. For sure. Also, I love this!!! I think I'd use something like a charcoal solid and a matching light blue for the backing because the front has plenty of pattern. Then for the binding I'd use a solid orange. I love this! I've got a husband and three sons, I'm always looking for more masculine patterns. I would use the orange for the binding, and the light blue with gears and the brown for the backing. Great job on your quilt! Orange backing, definitely and maybe the white with robots for the binding? The contrast would be good, I think! Wonderful quilt for the guy Julie! I'd go with the lighter blue with the dots (are they dots?) for the binding and then a pieced back with the red/ orange print and the orange print.and it s fun to see quilt out now for the guys that are more than just trucks, fish and dark colors! I'd use the dark blue circuit for the back and the orange/red circuit for the binding. I love that fabric. Such an amazing quilt! I think the orange on the right would be great for binding, and maybe the 2 light blues on the left for the backing. Orange binding, blue cogs and red for a stunning back. I vote blue for the binding and the red for the backing. 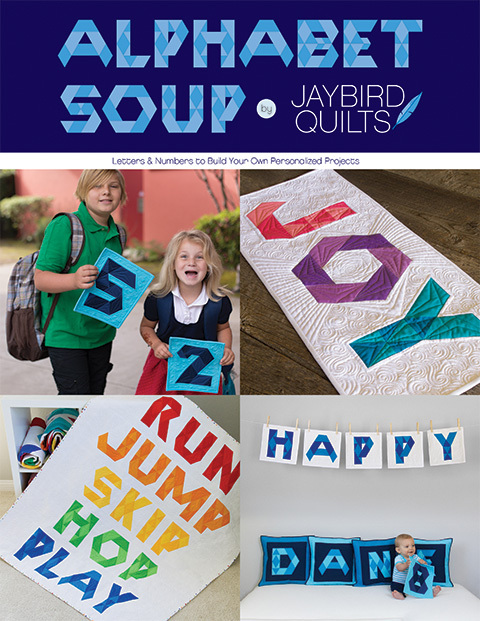 I really need this book, one husband, four sons and four grandsons and they all want quilts. I volte the light blue for the binding. And for the back all the colors in strings. Such an awesome pattern! The bright blue (second from the right) would provide great contrast for the binding. And then I guess I'd go with the white robots and the orange print for the back. I would use the lighter orange print for binnding and a pieced backing from the rest! Thanks for showing this pattern in different fabrics/colors! I love your take on the pattern. It's tough to choose binding/backing fabric because all the options go so well together. But if I had to pick, I'd probably bind in brown and use the orange and blue (the one right next to the orange, not the powder blues). At least, that's what I'm thinking now. I'll probably change my mind as soon as I hit "publish comment." I think I'd use brown for the binding (too help make the m stand out a little more) and red and orange for the back to make it pop! I should use the red/orange one for a binding and the white one for backing. Cute quilt you made! I'd use the bright orange fabric on the right for binding and make a scrappy back! I'd use the brown robots and blue cogs/spanners to piece the back and then bind with the red/orange circuits. 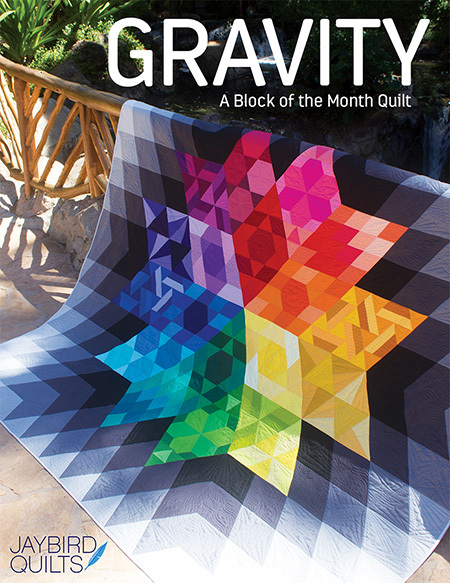 Great quilt and of course I'd love to win a copy of the book, it looks wonderful! Thanks for the giveaway. Love the quilt. I would use orange for the binding and the for the backing the darker blue with brown and orange. But if it was for a younger group I am in agreement about the robots. Thanks for the chance to win. I think I would use a darker print on the back and maybe a solid or blender binding. Of course, to see it in person makes a difference too. 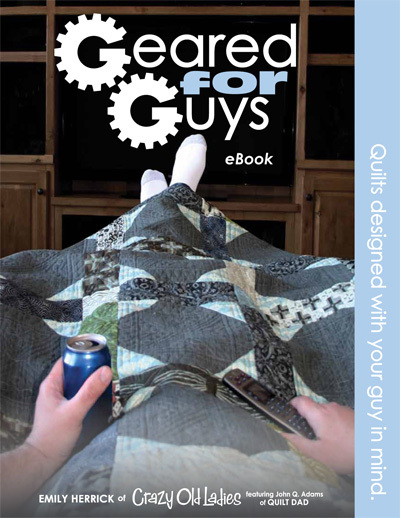 Love the 'guy' quilts and would love that book! I think the background fabric for the binding and the two oranges for the backing. What a very cool quilt. Very nice! I would go with the orange for binding and the two light blues for the backing. I would go with either the background fabric or the very first light blue for the binding, nothing with too much contrast to really let the letters shine! As for backing...I really love that red, maybe paired with the white robots, or the brown and orange colorways of that robot print. Good luck choosing! 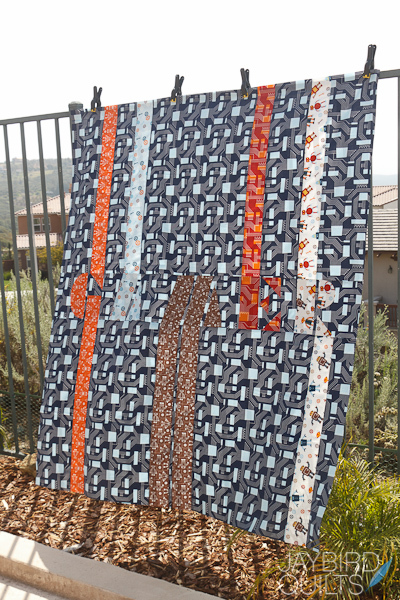 I always like my binding to be a frame for both the front and back of my quilt so I would pick the light fabric with robots for the back, and the orange without robots for the binding. Great pattern! I would choose the brown for the backing with the orange binding. Great quilt and book too. I would bind it in orange, with little bits of the other colors here and there, but spaced out around the quilt. I would use one of the light blues, and the medium blue circuit board fabric on the back. I love blues, so I'd go with one of the light blues for binding, and the other two blues for backing. Not too much ofa contrast but that's how I like it. I *thought* I knew what my opinion was until I started reading everyone else's good ideas... now I don't know what I'd do. I originally thought binding in orange and back in the white print and light blue print. I haven't read all the other comments, but my first instinct is to go with the brown accented with the orange for the backing. The blue for the binding would work well, I think. Have fun with it! I like the blue background fabric for the binding; the lighter blue and the white robots for the backing. I like the bright orange for the binding and the brown for the backing. Great gu quilt. Thanks for the chance at your giveaway. I know you posted the fabrics you have, but I think a solid binding fabric (probably in a nice reddish orange to pick up that color from the "G" and "E") would be very restful with all the busy prints on the front. For the back, I'd do a strip or two of the same solid binding fabric splitting the three blue robot fabrics. I would do the pale blue on the far left for the binding and maybe the fun orange print on the far right for the backing.. or the darker blue next to it... gorgeous either way! That's a super cool quilt! I want to make one, now! my grandson would LIKE one- I'm sure. For the back I'd choose the light blue with cogs & wrenches and the red/orange computer-y one , and for the binding I'd go with the orange robots. This book sounds awesome! Thanks so much for the chance to win! This book looks awesome! I'd use the brown for the binding and some of the blue and one of the orange prints for the back! Thanks so much for the giveaway! I'd use the darker orange print for the backing and the lighter orange print for the binding. This will be a great quilt no matter which you choose! I think the red & orange def needs to be on the back. AFter that the choice is yours. Oh and the binding should be the same color as the front if you have enough! GREAT quilt. I'd use the orange fabric as binding and the medium blue (2nd from right) fabric as the backing, with a stripe of the white fabric through the middle. Great quilt! I think the red circuit board fabric would look great as binding. Give it a bright pop of more fun. For the back I think the 2 light blue prints would look great. I think the orange (used in the G) would be great for the binding, and then the lighter blue and white for the backing to offset the darkness of the front. I would use the orange on the binding, and all the rest on the back. Good luck choosing! i like the orange robots for the binding, and the red/orange circut board with either the small gears or white background robots for the back. or all 3 for the back. I'm thinking a light blue binding and a darker blue for backing. I like the idea of something simple to play up the great print going on the front. I would use the brown for binding since its right in the center of the quilt, I think it would be nice to frame the quilt as well. For backing I would use the dark blue on the right with the orange right next to it. I think those to are so fun next to each other! Love the Gamer pattern. I mostly quilt for guys & me of course. My vote is for the darker blue computer chip fabric for the binding and either one or two of the oranges for the backing. For the back I would use the browned the white with multi colored robots. For the binding, I would use the orange - I love bright colors! The orange and orange/red print for the back and the binding in the blue background. I would use the dark blue with light blue squares (2nd to last one) for the backing and the bright orange (last one) for the binding! I would use the two on the right for the backing and the red in the middle for the binding. I think my DH would love one of these. I would use the 2nd and 3rd as the binding and the orange for the binding! Back it in the blue (second from right) and bind it with the similar reddish-orange - dead centre, 4th from either right or left. The orange prints in G for the binding and for the back the brown. I love book for guys. Interestin-looking book, and LOVE your quilt!! :-) I'd choose the brown for the backing and the darker red/orange for the binding! Thanks for the chance to win! I would use the orange/rust fabrics for the back - would be a nice contrast to the front. And I think I would go with a solid dark blue or black to pick up the colors in the background fabric for the binding. Thanks for the giveaway. I would use the brown and the blue that is next to it for the back to continue it's guy-ness. And bind it in the darker orange. I liked the darker orange as binding and maybe the brown with the background blue for the backing?